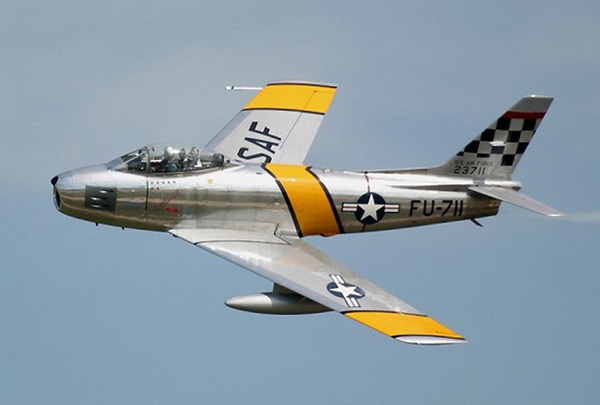 The North American F-86 Sabre was one of the greatest fighter aircraft of all time. It entered service with the USAAF in 1949 and although not as fast and maneuverable as the MiG 15, it was instrumental in denying air superiority to the Chinese during the Korean War. Afterwards, many Sabres entered service with dozens of foreign air arms, becoming the primary fighter of many Allied nations. Although the Messerschmitt 262 had swept-wings, the sweep was only 18.5°—too negligible to affect aerodynamics. The sweep was rather due to a change in the airplane's center of gravity with engines that were heavier than expected. However, utilizing data gleaned from Luftwaffe experiments, the wings and the horizontal and vertical stabilizers of the Sabre were swept back at an angle of 35 degrees in order to delay the onset of shock waves, thus allowing higher speeds. The origin of the Sabre began with an order on May 18, 1945, of three North American model NA-140 experimental aircraft by the US Army Air Corps.2 Designated the XP-86, it made its inaugural flight on October 1, 1947 at Muroc Dry Lake, California. It was equipped with a 4,000 pound thrust J-35-C-3 jet engine built by Chevrolet—production was later turned over to Allison. The highest speed attained was 618 mph (995 km/h) at 14,000 ft (4,267 m), it had a ceiling of around 41,300 ft (12,588 m)and its initial climb rate was 4,000 fpm (20.32 m/s). This was fantastic performance when compared to any prop-driven plane the US had produced up to the end of the war. Even North American's own prop-driven P-51 paled by comparison. Test pilots were ecstatic over the Sabre, with comments such as "...rock-steady gun platform." and "...so easy to fly you can almost control it with your thoughts". The third production F-86A-1 ("P" for "Pursuit" had been superseded by "F" for "Fighter" in 1947) equipped with a new J47-GE-13 engine of 5,200 pounds thrust (23.12 kN), set a world’s speed record of 671 mph (1,080 km/h) on September 1, 1948. The Sabre was armed with six .50-caliber M-3 machine guns in the nose, just aft of the jet intake. Target acquisition was aided by a new radar assisted gunsight. It required the pilot hold the cross hairs on his target for just one second. From then till the target was obliterated, the pilot was free of the complicated problem of adjusting for the target's range during the heat of combat. The F-86B (later redesignated F-86A-5) with a top speed of 679 mph (1,093 km/h) and initial climb rate of 7,470 fpm (37.95 m/s), represented a marked improvement over the A-1. A Wing of F-86A-5 aircraft arrived in Korea on December 13, 1950 making them the first Sabres sent to Korea. On December 17, they went into action against the awesome and hitherto invincible MiG-15. Within two weeks, the Sabres had established a "kill ratio" of better than 8:1 over the MiG. Admittedly, the superior training and tactics of the US pilots brought about a large part of this success, for the A-5 Sabre had inferior performance when compared to the MiG-15. It was slower and unable to maneuver as well as the MiG above 25,000 feet. Its service ceiling of 48,000 feet was much lower than the MiG. Nevertheless, the appearance of the Sabre was the beginning of the end for the MiG-15 in Korea. The Sabre was continuously improved throughout its 10-year production run. Each model performed better than the last. There were two major variations of the craft. 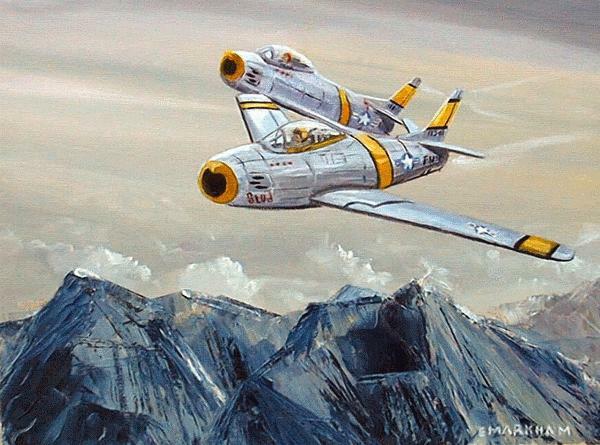 The F-86C was redesignated "YF-93" and was intended to be a "penetration fighter". However, it eventually came to a dead end. Ejection of a MiG Pilot—This unusual sequence of photos, taken by the gun camera of a USAF F-86 Sabre, shows a MiG-15 pilot abandoning his aircraft after being hit by the Sabre's gunfire. The second variation was known as the F-95 until July 1950, when it was redesignated the F-86D. It was labeled an "all weather interceptor". Some experts are of the opinion the "D" was so different from the basic model it should have retained it's F-95 designation. For one thing, the J47-GE-17 engine was equipped with an afterburner which delivered a total of 7,500 pounds thrust (33.36 kN) for take-off, giving the "D" an initial climb rate of 12,150 fpm (61.72 m/s)! The nose was shaped like a shark snout with an open mouth for an air intake. Above the mouth and projecting forward was the shark's nose, which housed a radar antenna for the Hughes E-4 automatic fire control system. More than anything, the F-86D resembled a shark right down to the fins, and should have been named so, but the Air Force brass was reluctant to pick a name with such a nautical connotation. The F-86 was the first USAF night fighter to carry only one airman and have only one engine. The fire control system was so automatic, a second airman was considered unnecessary. A pod containing twenty-four 2.75 "Mighty Mouse" air-to-air rockets was located in the belly. The pod was lowered into the airstream to fire the rockets, then quickly retracted so as not to affect the speed or handling characteristics any more than necessary. The pilot had to take great care to insure each rocket had cleared its tube when fired. If a rocket was hanging halfway out the tube and the pod retracted, the rocket would explode. If the pilot wasn't absolutely sure of the position of the rocket, he landed the Sabre with the pod extended. In one incident in 1957, at Wheelus Field, Libya, a Sabre touched down and a rocket fired and blasted a 15-foot hole in a rock security fence nearly a mile and a half away! The "E" was very similar to the "A" with the same J47-GE-13 engine, but was designed to carry a bit heavier combat load. Although the MiG-15 was more maneuverable and had better performance than the F-86, the Sabre's success can be attributed to the superior training and tactics of US pilots. The "F" was furnished with the J47-GE-27 engine with about 700 additional pounds of thrust (3.11 kN) (no afterburner), which increased its top speed to 695 mph (1,118 km/h). Combat range was increased from 660 miles (1,062 km) to 923 miles (1,485 km). The F was the first Sabre to haul a 1,200 lb (544 kg) nuclear bomb, which was carried under the port wing. In order to safely deliver this weapon, the aircraft was also furnished with a LABS (Low Altitude Bombing System) which allowed the craft to escape the blast. The "G" designation was temporarily given to the F-86D with J47-GE-33 engines. The plane was produced as the F-86D. About 6,200 Sabres were built in the US before production ceased in December 1956. Altogether there were 9,860 F-86 Sabres built in the US and 25 other countries around the world. 688 mph (1,107 km/h) @ sea level. Six .50 caliber M-3 machine guns - 265 rpg. 1. Robert Jackson. F-86 Sabre, The Operational Record. Shrewsbury, England: Airlife Publishing, 1994. 3. 3. Michael Taylor and John Taylor, ed. Encyclopedia of Aircraft. New York: G. P. Putnam's and Sons, 1978. 176. Created May 18, 1999. Updated November 15, 2013.